What is Blue Light? Is it Good or Bad? 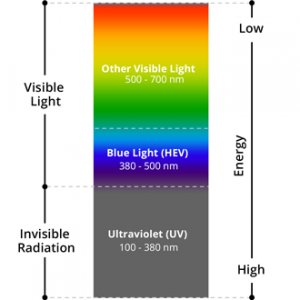 Blue light is the high energy spectrum of visible light, having a slightly higher wavelength, and therefore less energy, than ultra-violet (UV) radiation. The sun is the greatest source of blue light. The entire visible and non-visible spectrum of light emitted by the sun appears white and is only visible if the various energy levels are refracted or scattered. Blue light is by no means a bad thing. It's important for our mood and energy levels, having a direct impact on our circadian rhythm. However, unlike UV radiation, our retinas provide very little protection from blue light. The real danger is due to prolonged and very close exposure from digital devices with led and lcd screens. This includes computers, phones, tablets and other such devices. A particularly powerful source of blue light waves is found in any gadgets that use LED backlights to upgrade clarity and brightness. Granted, these devices don't emit nearly as much blue light as the sun does. But what's concerning optometrists and other health professionals today is the sheer amount of time we spend staring at these screens, and how close they are to our faces when doing so. Upwards of 60% of all people spend at least 6 hours per day looking at a digital device screen. This regularly leads to eyestrain and fatigue and puts us at risk of significant and serious vision conditions. In our Clarksville, TN eye clinic of All Eyes Vision Care, our optometrist regularly diagnoses and treats patients for conditions and symptoms relating to prolonged exposure to blue light. Computer Vision Syndrome (CVS), or, Digital Eyestrain Syndrome refers to a range of symptoms that arise from continuous and prolonged use of computers, cell phones, televisions, etc. Digital eyestrain is regarded as a serious medical condition that affects adults and children alike. With personal smartphones, e-readers and video games, kids spend more time with digital tools than ever before. All of this proximity to blue light jeopardizes the healthy development of children’s visual system. Before age 10, kids’ eyes are still developing. Until that time, their cornea and lens is still mainly transparent, which allows a greater quantity of damaging blue light to penetrate. We perform eye exams for patients in and around Clarksville, TN, and a large number of children and adults come in regularly complaining about symptoms caused by digital eyestrain. Studies are showing that continuous exposure to blue light can result in a condition that manifests in a very similar way to macular degeneration. The cells in the center of the retina (the thin tissue covering your inner eye) can be destroyed, and the risk of age-related macular degeneration is increased. A Harvard medical study reports that blue light is the most dangerous light for the retina, and chronic exposure will lead to a noticeable rise in the occurrence rate of macular degeneration, retinal diseases and glaucoma diagnoses. If you’re experiencing any of the vision complaints caused by blue light, contact us at All Eyes Vision Care for an appointment. We’ll help relieve your symptoms and restore your comfortable vision. It is our professional opinion that patients who spend hours on electronic devices are at risk of increased eyestrain and glare, macular degeneration or problems falling asleep at night, and may benefit from minimizing their exposure to blue light by using glasses or contact lenses which effectively block blue light. Contact us to learn more.